Green Wall - Contemporary - Garden - San Diego - by Amelia B. Lima & Associates, INC.
A 4o feet long green wall creates a living colorful mural on a side yard. 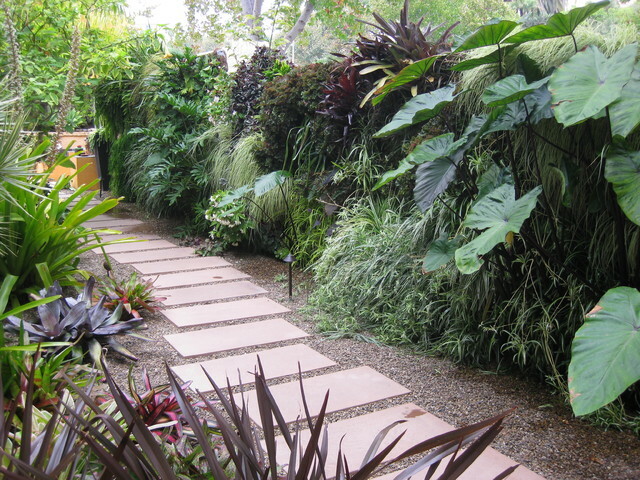 WHEREChoosing a position There are many possible ways to incorporate a green wall inside your home or garden. Vertical gardens are a perfect solution for greening courtyards and balconies – they jazz up boring walls and act as a focal point to draw the eye through a space. They are also an effective foil for an unsightly boundary fence and can accomplish an effect that planters and troughs alone can not. In addition, they’re a good way to elevate plants out of reach of small children and pets. Claudia De Yong Garden Design added this to Can I Have a Lawn-Free Garden That’s Kind to the Environment? Love the textures in this. Back terrace fenceline?